Makers of resonator guitars, mandolins and ukuleles, like all musical instrument companies, come and go. Some have long histories and are dedicated to the instruments they make and others make the instruments only as long as resonators seem to be in vogue. Here’s a survey of who is making or importing resonator guitars, mandolins or ukuleles today (June 2013). The first resonator guitar company was National. The second company, founded by the same family, was Dobro. Another name famous in the early years of resonator instruments was Regal. They made guitars under their own name and supplied bodies to National and Dobro. Those companies no longer exist although the successor to Dobro is now part of Gibson. The names live on but exist under new owners. Before reviewing current resonator makers, let’s review resonator designs and options. Resonator string instruments generate sound through the vibrations of spun aluminum resonator cones instead of the wood top of an instrument. There are three designs of the cones. They are the tricone, the single cone biscuit bridge and the single cone spider bridge. The first resonator guitar design was the tricone where three inverted aluminum cones face into the instrument. A “T” bridge connects all three cones and transmits the string vibrations to the cones. The second design of resonator guitar (or other instrument) is the single cone with a biscuit bridge. A larger cone is used than for the tricone design and the saddle sits in a slot of a wood bridge that is round and looks a bit like a biscuit. This rests on the apex of the cone which again faces into the instrument. These instruments are generally louder than a tricone with a wide dynamic range – which can be good for blues but bad when trying to record. The final cone design is the single cone spider bridge. An eight legged metal bridge rests on the edges of the aluminum cone. The cone faces out instead of into the instrument. The sound is actually similar to the tricone in that the dynamic range is controlled (think compression if you’re an electric guitarist or into recording). See my other articles for the history of these guitars. However all three designs were made by John Dopyera (although there is a dispute regarding the biscuit bridge design – the original patent for the biscuit bridge design was issued to George Beauchamp who had urged John Dopyera to design a louder guitar for him and co-founded National guitars with John). Guitars aren’t the only instrument made with a resonator. The other instruments include 12-string guitars, mandolins, ukuleles and electric guitars (resolectric). The bodies of resonator instruments can employ an interesting variety of materials. Nickel plated brass and German Silver (another plating process for brass) were two of the early materials used. Steel, copper, bronze, fiberglass and of course wood can also be used. Finishes can be painted, plated if metal or left raw. The necks of guitars can be round for standard guitar playing or square necks for lap playing. Amistar has been making resonator instruments since 1991. They are located in the Czech Republic. Originally they made the Continental brand resonator guitar which were assembled by AMI in Germany. I believe they continue to make guitars that are branded as being from other companies, but they also make and sell the Amistar brand. They make a wide range of styles of instruments. Metal instruments include single cone biscuit bridge guitars, 12-string guitars, electric guitars tricones, tenor guitars, ukuleles, mandolins and bouzoukies. They also make metal square neck tricones. Wood bodied instruments also include single cone biscuit bridge and tricone models, square neck spider bridge models, and ukuleles. Amistar’s distributor in the USA is Vagabond Instruments. Beard makes high quality resophonic instruments. Most designs are single cone, spider bridge instruments in wood. Jerry Douglas and the late Mike Auldridge have been Beard guitar users and endorsers of his square neck instruments. 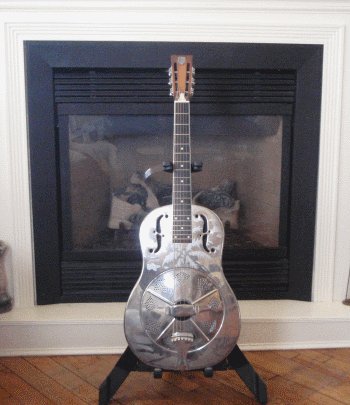 Beard’s first resonator guitar was made in 1985. His “R” design is based on Mike Auldridge’s pre-war Regal resonator guitar. Beard also makes round neck resonator guitar and ukuleles. He has made custom instruments including a guitar with interchangeable cone systems – choose biscuit bridge, spider bridge or tricone. Beard entered into an agreement with Goldtone who makes reasonably priced imported versions of Beard designs. These are then setup in the USA by Beard. Beltona was founded by Steve Evans and Bill Johnson in 1990 in the UK. One was a luthier and the other an engineer and both were interested in building resonator instruments. They specialize in building resophonic instruments with carbon or glass fiber bodies and unique designs. They are currently located in New Zealand. They make square and round neck guitars as well as ukuleles and mandolins. Most designs are biscuit bridge resonators but their original design was a tricone. Dean guitars has a fairly large collection of resophonic guitars. These are currently listed in the “Bluegrass” section of their website. The guitars are imported and moderately priced. Design options include electrified, metal or wood bodies, cutaways and biscuit or spider bridge resonators. The metal bodied instruments include plated steel (iron in their specs), copper and brass. Fender instruments are widely distributed which means they are easy to find both locally and online. They currently have a limited selection of only four models of resonator guitars. The most interesting is the Reso-Tele(R). They have two models of spider bridge resonators. One is electrified (pickup) and has a cutaway. They have a metal bodied biscuit bridge model for slide guitar. These are low or moderately priced instruments and I assume imported. Fineresophonic is a French company making excellent resonator instruments. Their website is (of course) in French. Their designs include tricones (triplates), single cone biscuit bridge, metal and wood guitars. They also have resolectrics, ukuleles and a mandolin. The instruments are made by luthiers Mike Lewis and Pierre Avocat. They’ve been making resophonic instruments since 1988. The history of the development of the resonator guitar sometimes seems like a soap opera. Dobro was formed when John Dopyera had a disagreement with his partners at National. Dobro is a contraction for Dopyera Brothers. The Dopyera family continued to own Dobro after they re-merged with National. But after World War II they lost the right’s to the name. Eventually Gibson acquired Dobro as the Original Acoustic Instruments company. Gibson still sells Dobro guitars, now branded as Hound Dog guitars. Their current website for Resonator guitars lists only wood bodied, spider cone resonator guitars in both square and round neck styles. Gretsch is currently listing resonator guitars as part of their “Roots Collection.” These are imported models, all under $1000. The four guitars in the collection include wood bodies biscuit bridge and spider bridge guitars and a metal bodied guitar. Two models come with an option of either round or square necks. Ibanez, not to be left behind, has a resonator guitar listed on its website. There is just one model, the RA100. It’s a round neck, spider bridge 12-fret wood bodied guitar. Jarron “Tooter” Meredith makes some expensive and very nice looking wood bodied spider bridge resonator guitars in Athens AL. These are custom items with many options in terms of woods and finish. The image gallery I’ve linked to shows all to be based on a dreadnaught body size. Full Disclosure: I own a National Style O guitar complete with engraved palm trees on the body. Don Young formed National to recreate the best copies of the original National designs that he could. Because they specialize in the early National designs, they make tricone and biscuit bridge single cone designs but not spider bridge designs associated with Dobro. However the Dobro designs are now being made by Smith & Young as a division of National (see below). National makes one of the widest range of resophonic guitar models. I just counted 28 models of single cone, metal bodied guitars. Their single cone wood bodied models includes a 12-string and a baritone guitar. Tricone models include a cutaway model and a wood bodied model. They also make resolectric guitars, mandolins and ukuleles. These are high quality American made instruments (not inexpensive). Recording King makes moderately priced instruments based on classic designs. These are no doubt imported and may even be made by companies listed above. Still, they offer a nice selection of more affordable instruments. Metal bodied instruments include tricones, biscuit bridge models, mandolins and ukuleles. Wood bodied instruments are limited to spider bridge guitars. Regal is now a name owned by Saga Music. They import reasonably priced resonator guitars including metal tricones and biscuit bridge models and wood spider bridge models with round or square necks. Rogue is a low cost brand distributed by Musician’s Friend, Music 123 and perhaps other online merchants. It isn’t clear who actually owns or makes the guitars. I had at first assumed it was a house brand. But now it doesn’t seem so. The lowest cost resonator guitars I can find are generally from the Rogue brand. Their models seem to mimick Regal (and perhaps they are the same source). These may be a good choice if you want to try a resonator guitar but not risk much money. Smith & Young are now a division of National specializing in spider cone resonators. So far there are two models listed on their website. The Model 1 is a steel bodied guitar while the Model 11 has a wood body. Weber is known for making very nice Mandolins and related instruments. But they also make archtop guitars and resonator guitars. Their models include spider bridge, wood bodied guitars with square or round necks. They also have a biscuit bridge round neck series. Wechter Guitars makes two round neck models, one with a cutaway, and three square neck models. All are wood bodied spider bridge designs.